No one is entitled to anything. Do the work. Love the hustle. Throw in some raw courage. Mix and serve. 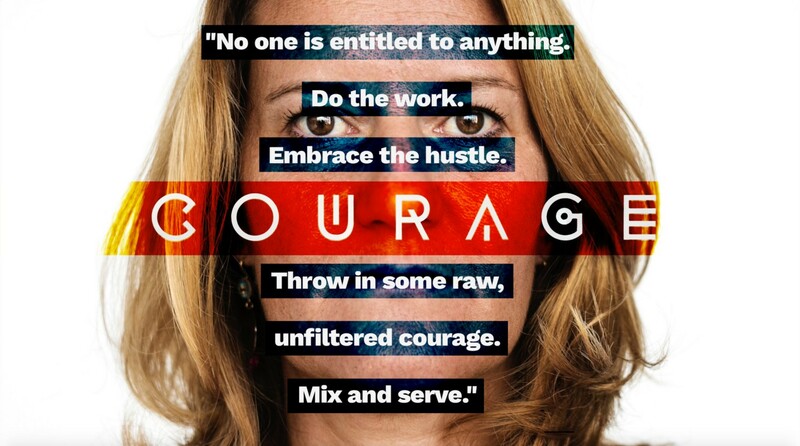 Courage is one of those qualities we see amongst the best brands, the most inspiring business leaders, the most copied entrepreneurs and the most revered artists and creators. In place of courage are shallow understandings, quick one-liners, glib sound bites and superficial punch lines as much for brands as for people. And not understanding why courage is important has forfeited our independence as a result — for without courage, one backs away from living life fully, all for a quick chance in the spotlight. Or a quick buck. Or some mediocre result. Whether you’re afraid or not, courage comes down to this: what we choose to do. It’s the pivotal difference between true courage and some inclination to simply fight anything that might be different: Courage isn’t about tackling some past fear or demon. It’s about making it possible for some future objective to arrive successfully. Just ask the most successful, the most adventurous, the most “fearless” of us and they’ll tell you their “bravery” wasn’t about the past but about ensuring some future goal or dream could survive. These were the thoughts and ideas I was engaged in last year after seeing more people feeling “entitled” and less people displaying the courage to take a stand for something worthwhile, do something possibly uncomfortable and withstand any opposition in order to get there. Unless we demand more of ourselves. And our colleagues. And business partners. And those we serve. And wake up the next day all ready to do it all over again. Bringing so much value to every interaction that it redefines our a new standard of expectation with every gesture we make professionally and personally. And this is what’s inspired me to write, narrate and create this video. It was easy to put on paper what I was thinking. But it took some courage to capture the raw emotion of the message. Because this message is a very personal communication. No matter what you do: business, artistic, entrepreneurial, writing, entertaining or creating music. It seems the world could use some more courage, now more than ever.